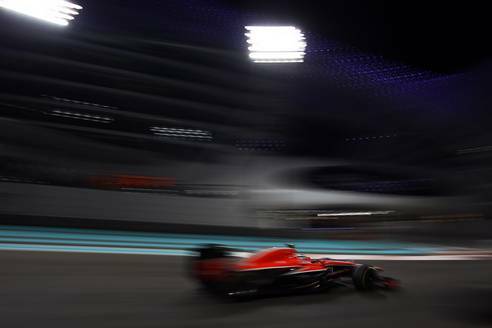 Both Jules Bianchi and Max Chilton expressed their frustration after technical problems affected their running ahead of the Abu Dhabi Grand Prix. Bianchi qualified in 20th place but will drop to the back of the grid after sustaining a penalty for a gearbox change. The replacement was necessary after the Frenchman spun off track in final practice. "It has not been a good day on my side, so to work hard together to come back from that is a big plus and I am happy with my final run, which was good enough to split the Caterhams," he said. "In FP3 I had a problem at the rear which pushed me off track and into a spin. Thankfully I was able to avoid hitting the wall too hard but there was damage to the gearbox which meant that we needed to change." "It is disappointing to have a good lap in qualifying to recover from FP3, only to then have a penalty that will mean I have to start from the back. We will work to find a good strategy to get ahead of the competition." Max Chilton qualified in last place but will start from 21st following Bianchi's penalty. The Brit reckons a DRS problem accounted for a significant chunk of his deficit to Bianchi. "It has been a difficult day overall but particularly in qualifying with the DRS issue," he said. "On the first laps of the second run I went faster, but on my second flying lap there was nothing left in the tyres, which is disappointing because I think Jules and I would have been pretty close again when it counted." "Looking at what I lost from DRS and also by doing three laps versus one lap, we can say that the time loss was significant. However, tomorrow is another day and we’ll be pushing to make it a positive one."